These photos mark our favourite part of the Hongkong trip. It was to Sai Kung, out north-east of Kowloon, right by the sea. 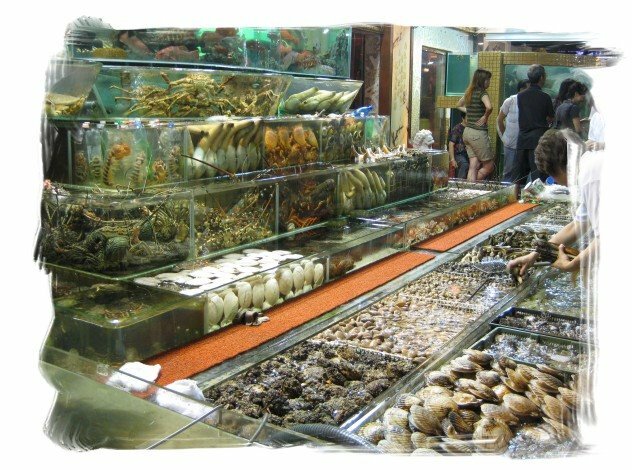 There was an entire row of seafood restaurant after restaurant, each with huge aquariums containing the most amazing array of sea creatures, and with accompanying crowds of diners. There were fish, crabs, clams, prawns, sea urchins, geoducks, sea snails, lobsters and eels among others, with many different species of each. We had to get a tag to pick our seafood. This process meant going to the aquariums and choosing what we wanted. 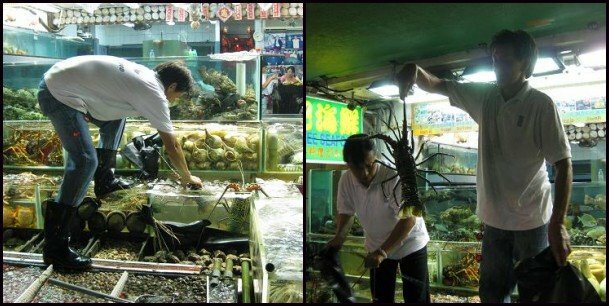 The restaurant staff would then pick up the creatures (with their hands, nets etc) and show them to us. If we agreed to that specific creature, he would then weigh it using a balance scale and lop it into a bag. We weren't fussy nor very knowledgeable (compared to other regular diners who would pick and choose each creature), so we said yes to all that were picked for us. A waiter would then come by to ask us how we want our choices to be cooked. Again, there were so many ways to choose from so we went with whatever was recommended - which turned out to be really good! After the process at the aquariums, we had to wait for our seats. We had earlier taken a queue number, but our Hongkong friend who came by told us later that there was no point to that, because someone would just shout: "There's a table of 8! Who wants?" And someone would march forward to "claim" that table. So it was a good thing that our friend came by to help us out! 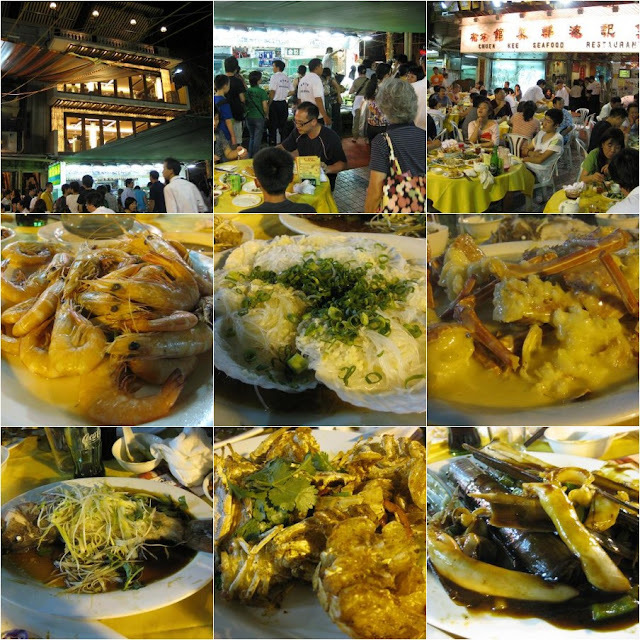 The food wasn't cheap, but reasonably priced, considering the amount we ate and the freshness of the seafood. We paid about SGD$80 each. - Lobsters: Cooked in a cheese sauce with noodles - heavenly! 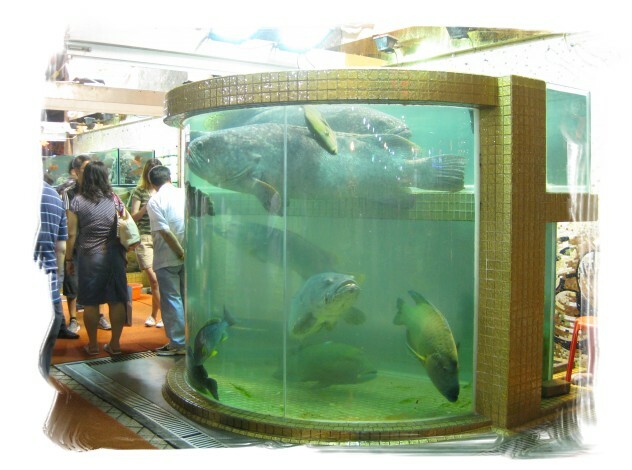 if u like the experience of picking ur seafood from tank then deciding how u want it cooked, shd go turf city! there's even 50% discount mon-thurs :) quite good deal! it looks all exciting!!! i do like seafood!!! now that ame reminded me of the turf city thingy, i remember i haven't tried it! a turf city dinner date anyone? ame: Oh, I've heard about the Turf City one but I've never been there! 50% discount sounds great =) Apparently there are a couple in KL too - for a fraction of the prices in HK. ahh, that looks very good! i love seafood. must remember to explore sai kung the next time i visit HK! Yeap, Turf City has the same concept. Oooh, I miss lai liew har! Cant get these here! candice: Yes it is well-worth the trip! A very different side to HK. lms: I'm going to try Turf City someday! But I suspect the variety won't be as wide. I was very tickled by that name! corsage & lms: i've tried the turf city's 奇怪海鲜! i usually go to the owen restaurant to prepare the seafood. i LOVE the cheese oysters! i didn't get anything very unique (read: odd) cos i'm not that adventurous with food. but it's a really good deal when we eat there on mon-thu (50% off!). weekends 30% off, also not bad!